Could Energy Innovation Create A 'Green Bubble'? The Obama administration has been heavily promoting the development of more renewable sources of energy, such as wind and solar. In the wake of the housing bubble, some are speculating about whether a renewable energy bubble might be on the horizon. 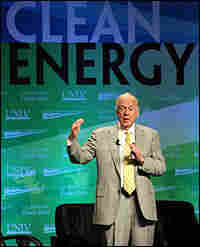 Texas oilman T. Boone Pickens now champions renewable energy sources. 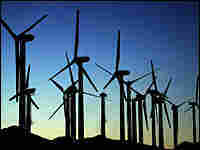 He has been forced to delay a 1,000-megawatt wind project in Texas because of snags in funding. 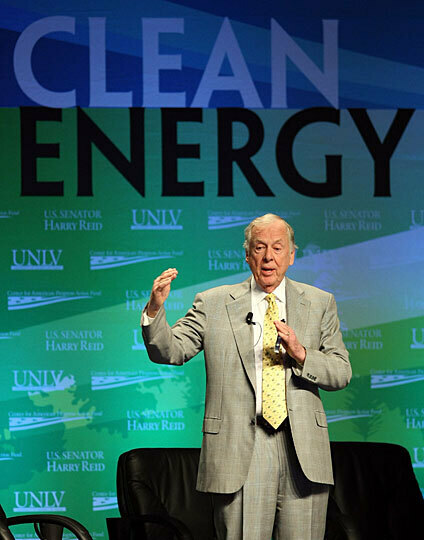 Here, he delivers a keynote address during the National Clean Energy Summit in Las Vegas on Aug. 19. In a series of ten stories airing this week on Morning Edition and All Things Considered and published here on NPR.org, we examine the costs, the politics and other challenges of upgrading the country's electricity grid. 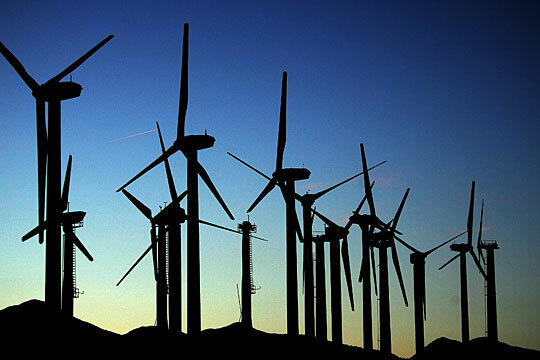 Wind projects, like this one near Palm Springs, Calif., could be the start of a green energy "bubble." One argument for a major overhaul of the U.S. electricity grid is to encourage the development of more renewable sources of energy, such as wind and solar. President Obama certainly has gotten behind green energy, and his administration is part of a concerted effort to help the industry grow. In the wake of the housing bubble, that has some asking whether the country is headed for a renewable energy bubble. Eric Janszen founded the financial advisory company iTulip in the midst of the Internet stock bubble. Janszen, whose company was named for the Dutch tulip bulb bubble in the 1630s, has made a career out of studying financial bubbles. He says bubbles start with a kernel of something good — say, homeownership or the development of the Internet or, in this case, energy that causes less pollution. But then, he says, outside forces come in and create a sort of mania. "You'll know that we're at some stage of an energy bubble when you start to hear about how you can get rich quick in the energy market," Janszen says. But first, he says, a few things have to happen. There must be significant government involvement designed to focus energy and capital on the specific industry — and clearly that's already happening. "To really make these things go, you need a new source of credit," he says. In the housing bubble, it was mortgage-backed securities. Janszen says this element is important because you need a lot of capital gushing in to inflate stock and other asset prices. But credit is a problem right now for renewable energy developers. Texas oilman T. Boone Pickens was forced to delay construction of a 1,000-megawatt wind project in Texas, and worries about an impending renewable energy bubble aren't keeping him up at night. "I wake up in the night wondering 'Where am I going to get the money to build this project, because I've already got $150 million in it'," Pickens says. He says part of the problem is that natural gas prices have dropped by more than half since last summer, and it's difficult to justify using wind to generate electricity when gas is so much cheaper. Add to that one of the other challenges of wind: It's going to rely heavily on an upgraded electricity grid that isn't built yet to get power from wind corridors to population centers. Pickens says another issue may stand in the way of a renewable energy bubble: While the Obama administration is promoting the industry, the specifics of the government's plans aren't completely clear. "But I think once you get through this year, it's going to be pretty clear how they expect [to] cause the industry to kick off and go," Pickens says. Congress is working on legislation that would limit greenhouse gas emissions and then turn them into a commodity that can be traded. Such a cap-and-trade system might be the seed for creating the credit necessary to get a renewable energy bubble going, Janszen says. "Some think the investment banks will get into the cap-and-trade business and figure out a way to use that market to create securities that can then be the foundation for an asset price inflation," Janszen says. So, while a few people out there still see the potential for a renewable energy bubble, more pieces have to fall in place first, not the least of which is major upgrades to the country's electricity grid. Planning for that is under way. The Electric Power Research Institute was given $1.3 million in federal stimulus money recently to develop a framework for grid developers to follow. The group expects to complete that work by early summer.